Mold poses a serious problem to a homeowner. Often, mold growth can result from a source of moisture such as a leaking pipe, roof leak, etc. If these leaks are found and remedied immediately, mold growth is minimized. However, if a leak goes undetected, the results can be disastrous. As shown in the photo below, the pipe in the wall had a small leak that was undetected for 4 months. If you suspect that mold may be a problem in your home or business, it is imperative that corrective measures are taken as soon as possible. We recommend that an Indoor Environmental Professional (IEP) conduct a testing of the structure to determine if indeed mold is present. An IEP, through testing, will be able to determine the type(s) and quantities of mold present. Also, a good IEP will write the protocol for the mold remediation to follow. This ensures that there is a written procedure in place to safeguard homeowner property and health from mold related issues. Sometimes mold can be localized to one wallor one room. 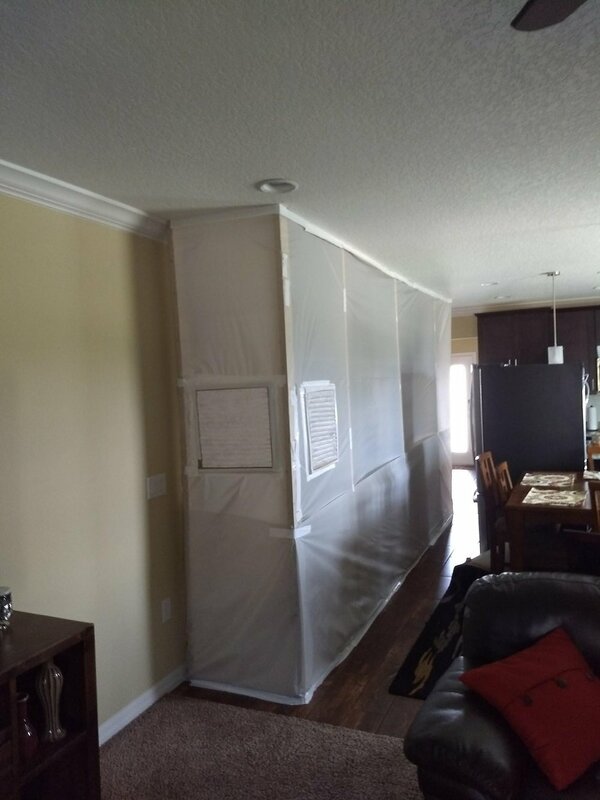 In cases like this, it becomes necessary to build a containment barrier and apply negative air pressure to the containment chamber in order to prevent mold spore migration to unaffected areas of the structure. An example of a containment structure as seen in the following pictures. When remediating mold, the industry standard requires the removal of the affected materials. Many times this necessitates the removal of drywall. Drywall removal creates a large amount of dust and debris, most of which is affected by the mold. 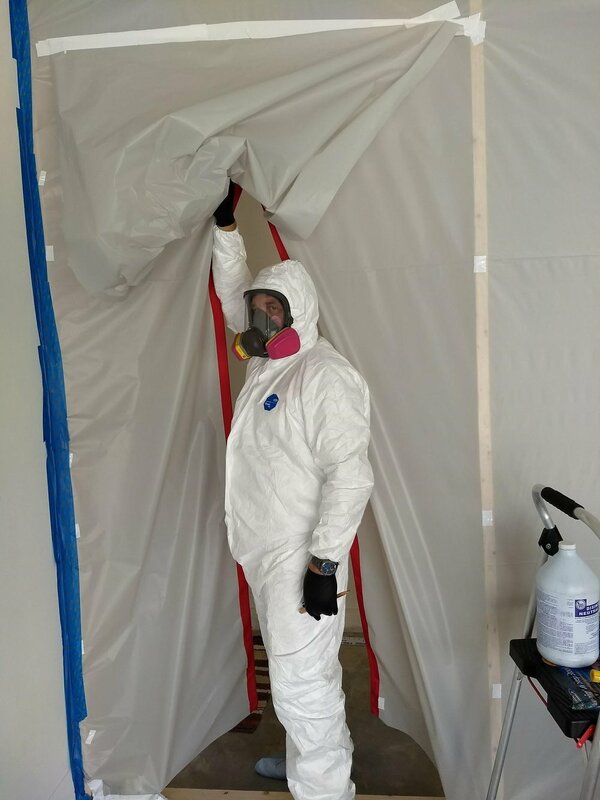 A solid containment structure with negative air pressure being exhausted to the exterior of the structure is the most common method to remediate mold that is contained to a certain area of the structure. In the picture below, note the air filters placed on the structure. This insures that the “make up” air, that is replacing the exhausted air, will not cross contaminate the area being remediated. It is also necessary that all technicians performing the remediation services are adequately protected and well trained. Our company uses the IICRC certification classes and continuing education courses to insure that we are providing the most up to date, safest and reliable methods to insure a successful project completion. The safety of our technicians and our customers is our highest priority no matter how large or how small the project may be.